Generously, butter 9×9 inch glass baking dish or 8 individual baking dishes. Place torn bagels in large mixing bowl and pour over milk and cream. Let absorb for about 10 minutes. Meanwhile, melt butter and let it cool. When cooled, mix with beaten eggs and remaining ingredients. Retain a quarter cup of the blueberries. 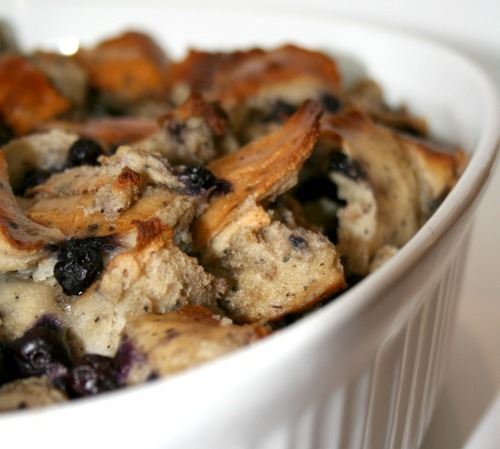 Combine with bagel mixture, distributing blueberries evenly in mixture. Distribute the remaining blueberries over the top of the dish(es). Pour into prepared baking dish; place in center of oven. Bake uncovered for about 35-40 minutes or until knife inserted in center, draws cleanly. NOTE: If using soufflé or deeper dish for baking the entire pudding, reduce temperature to 375° and allow for longer baking time; test at 40 minutes. If using individual dishes, bake at 375° F and reduce baking time to 30 minutes, test for center for doneness on each.